As 2016 comes to a close, we’re still talking about email marketing because it’s that important to staying connected to your customers. As the leading customer communications platform for dentists, doctors, veterinarians, salons, spas, and auto shops, the team at Demandforce knows emails. One of the most powerful features of Demandforce is one-click email campaigns. These are campaigns that you can send out to your email database with—you guessed it—one click! But before you send your first email, you might be wondering about some Best Practices for Email Marketing. There’s so much information out there, it can seem overwhelming sometimes. 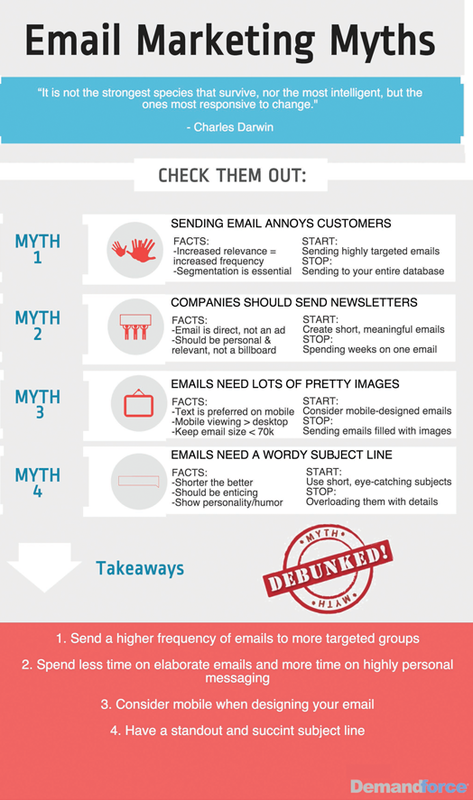 That’s why we created this helpful and simple infographic that outlines the 4 Email Marketing Myths we hear the most. Don’t fall for the hype and take the first step in elevating your email marketing! We hope you enjoy this infographic, and if you want to chat with our team about Demandforce, set up a free consultation with a Demandforce expert by clicking here.